One of the many benefits of retractable awnings is the ease with which you can open, close, and maintain the structure and fabric of your awning. This makes it much easier to take care of your retractable awning through the winter months, when snow, ice, and harsh weather can cause damage to your shade structure. But there are steps you can take to prevent your awning from being damaged and keep it clean and well-maintained throughout the winter. Here are some helpful tips for caring for your retractable awning during winter. First things first: you need to make sure your awning is totally clean to prepare it for winter storage. Proper cleaning will depend on your fabric material. Since there are many different types of retractable awnings to choose from, make sure you look into the best maintenance care for your awning type, whether it’s vinyl, canvas, or any other available awning material. After removing your awning, lay it out and clean it with the appropriate cleaning tools and fabric cleaners to avoid any damage that debris or other buildup can cause during winter storage. It’s also important to make sure your awning stays dry through the winter. After all, the careful cleaning you did will go to waste if moisture is retained in the fabric, breeding unhygienic mold and mildew growth. Mildew can affect the look of your awning, but it can also cause it to smell or undergo water damage, requiring replacement of the awning altogether. Make sure that you check your awning all over for signs of damage. The edges and seams of an awning will usually be the first places to tear, and if you catch them early, you can simply fix them yourself with a repair kit. This will help you avoid any costly maintenance or replacement come spring, and it can greatly extend the life of your retractable awning. The best time to check for these tears or other damage is when taking down the awning for winter. Storage will help prevent damage from snow and ice buildup throughout the winter. 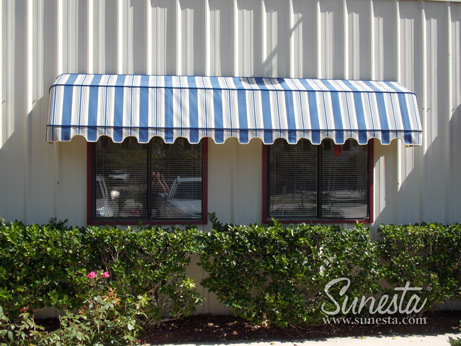 Be sure to store your awning in a dry place. This will help prevent mildew growth or damage throughout the winter. You may also want to store your awning fabric in a waterproof bag or tarp to prevent any moisture from getting in and causing issues.